Hampden Park Stadium often referred to as just Hampden is the home ground of the Scottish national football team. Located in the Mount Florida area of Glasgow with a capacity of 52,025, it is the second largest stadium in the country behind Celtic Park. Upon opening on the 31st October 1903 Hampden Park with its capacity exceeding 100,000 was the largest stadium in the world at the time, with other iconic National Stadiums such as Wembley (1923) and Brazil’s Maracanã (1950) yet to be built. Hampden continued to grow in size, and in 1937 a record attendance of 149,415 was set when Scotland took on historic rivals England in an early grudge match. Located within the Mount Florida area of Glasgow, Hampden Stadium houses the offices of both the Scottish Football Association and Professional Football League, and has historically been the final venue of the Scottish Cup as well as a clutch of European Competitions. To date Hampden has hosted the Champions League Final three times, as well as two Cup Winners Cup and one UEFA Cup Final. 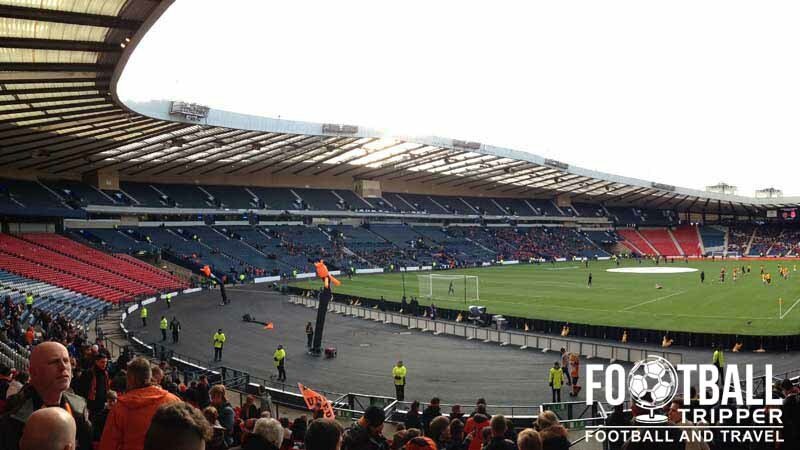 In recent years the ground has arguably become less relevant in the footballing world as Hampden temporarily closed to undergo renovations in order to host athletics during the 2014 Commonwealth Games. Even before this, the prestige of the venue has been declining ever since Celtic Park eclipsed Hampden in size, and Rangers’ Ibrox became only 1,000 or so seats smaller in capacity. Regardless of recent years, the future is bright future Scotland’s National Stadium, with Hampden Park set to return to prominence after it was chosen as one of 13 venues for UEFA’s Euro 2020 tournament, which is set to be held across the continent as part of the competition’s 60th anniversary. This will once again place the historic stadium in the same bracket as Europe’s elite grounds. Hampden Park is comprised of four sections: North, East, South and West. Teams who play each other in the Scottish Cup Final are usually allocated around half of the stadium each on a seemingly random basis, however due to their numerous appearances over the years it has become tradition for Celtic to always be given the East End, and Rangers The Western side. When it comes to International matches travelling supporters are usually housed in the corner between the south and westernmost stands, with the 3,000 seats distributed predominantly amongst the lower section, although some fans may find themselves in the small upper-tier. 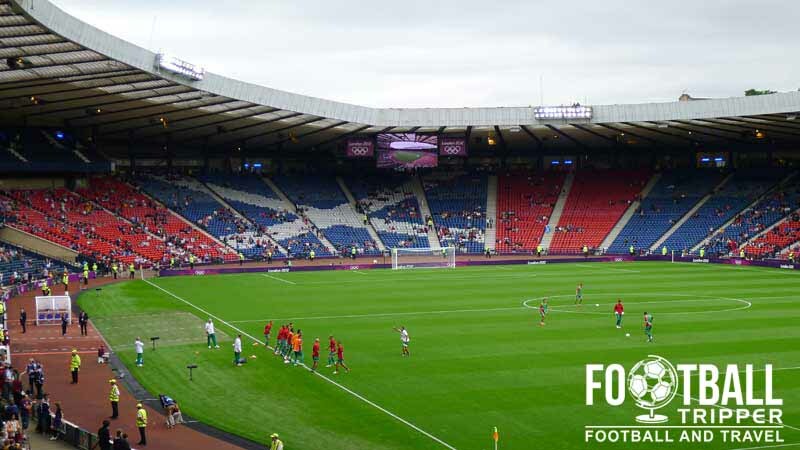 There are half a dozen pubs located within a 10 minute radius of Hampden Park, as well as numerous pubs such as Edward G Wylie Wetherspoons within Glasgow city centre which is for most football fans where they will be travelling from. The two most popular pubs are usually the Florida Park and Montford House located either side of Hampden Park, with Clockwork Beer Co sneaking up as a close third. This is a Microbrewery pub with a fine selection of both ales and what some might consider Scotland’s national drink – Whiskey. Further along Battlefield Road back towards The Victoria Infirmary there are a few boozers such as Armstrongs and the Church on the Hill. This is the furthest away however it is arguably the hidden gem of the bunch, located beneath the Battlefield monument which gives it a great ambiance on matchdays. During the walk from Mount Florida train station to the ground you will encounter many fast-food joints where you can grab a quick and greasy bite to eat. Located next to a campus of Glasgow Clyde College battlefield road is teeming with familiar franchises such as Greggs, Subway and Dominos Pizza. Cathcart Road which runs west adjacent to Hampden contains lots of an a diverse range of independent eateries ranging from Italian to Indian, and Chinese to Glaswegian. For a healthier choice there is a co-op back towards New Victoria Hospital and a large Asda north-east of the ground on Prospecthill. Although the official website doesn’t offer any clues as to the type of food on offer and the prices, you can safely assume that the usual fast-food fare such as burgers, hot-dogs and pies are available to purchase on matchdays. There doesn’t appear to be a permanent store at Hampden Park, however the national museum does have a small gift shop which sells some merchandise. Whenever a football match is held there are a number of official and unofficial stalls and kiosks selling gear of the Tartan Army. The exterior of Hampden Park as seen from King’s Park within the Mount Florida area. 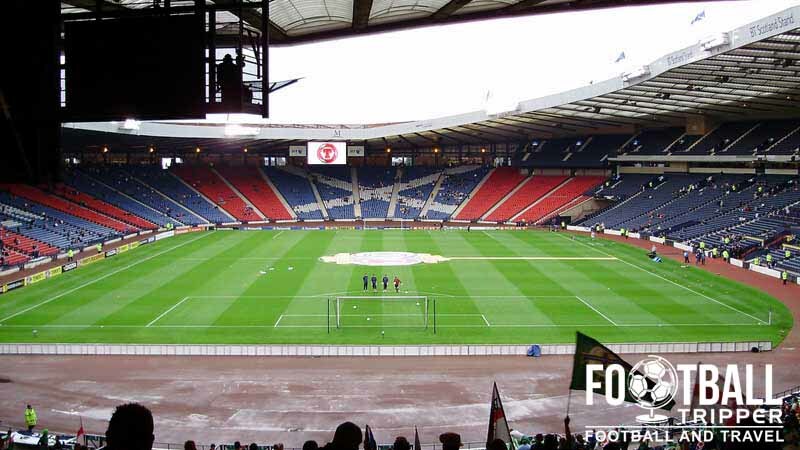 Described as The Hampden Experience, fans of the Tartan Army can now combine a fully-guided tour of the national stadium with a trip to the Scottish Football Museum which is also located at the ground. Open seven days a week, Monday to Saturday: 10.00 am – 5.00 pm, and 11.00 am – 5.00 pm on Sundays, visiting Hampen is a very popular tourist attraction. Please note that you don’t have to combine the tour with the museum if you don’t want to, and can pay £8.00 to visit either section of the ground although it’s not really the full Hampden experience. Family Ticket is for 2 adults plus 2 children and saves you around £5.00. 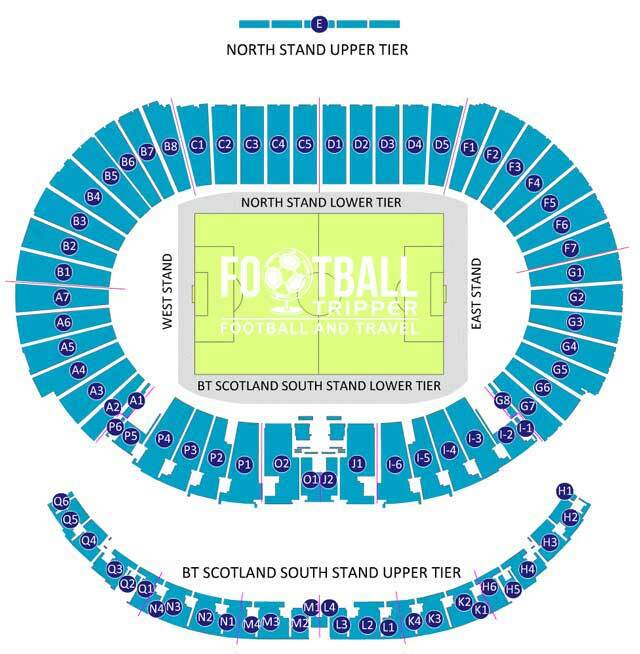 Tickets to see the mighty Scotland play at Hampden can be purchased from the Scottish FA Website, and are usually on sale in the months leading up to the game. Similar to how a lot of domestic clubs sell their tickets, the Scottish FA firstly offer tickets to members of Scotland’s Supporters Club followed by season ticket holders and then members of the general public. No matter how famous the opposition team may be there are usually some tickets reserved for general sale, and if you visit the website regularly or sign up for updates via email you should be able to obtain tickets fairly easily providing you plan in advanced. Please note that all prices are based on a ticket for a single adult, prices for Children in the east stand are £15.00, and all figures do not include booking fees. Scotland’s National Stadium is located within the Mount Florida area of Glasgow which is located 3 miles south-east of the city’s historic centre. One of the main welcome signs to Scotland’s National Stadium, Hampden Park. Glasgow City Council has recently introduced parking permits for local residents usage during major sporting events and thus on-road parking is no longer possible around Hampden Park. The city instead recommends Queens Park Car Park which opens approximately 3 hours before kick-off and costs £5.00 per car. The postcode for satnav is G42 8BS. For further parking options check out City Parking Glasgow, which is a wholly owned subsidiary of the local city council. Mount Florida Station is the closest stop to Hampden Park at less than five minutes walk away from the ground, with the previous stop at King’s Park Station also walk-able within 10 minutes or so. The service is operated by First ScotRail and runs from Glasgow Central Station. The sign for Mount Florida Railway Station which is the closest to Hampden Park. Usually there are around five services an hour with two in either direction, however on matchdays this can sometimes be increased to ease congestion. For similar reasons, a third platform was added to the station for use during major sporting events. If you don’t fancy catching the train for whatever reason then First Glasgow also operate a series of bus routes from the city centre to Hampden Park Stadium. Regular services include 5, 6, 7, 7A, 34 and 90. For further information and for up to date timetables please visit Traveline Scotland or phone the help line on 0871 200 2233. 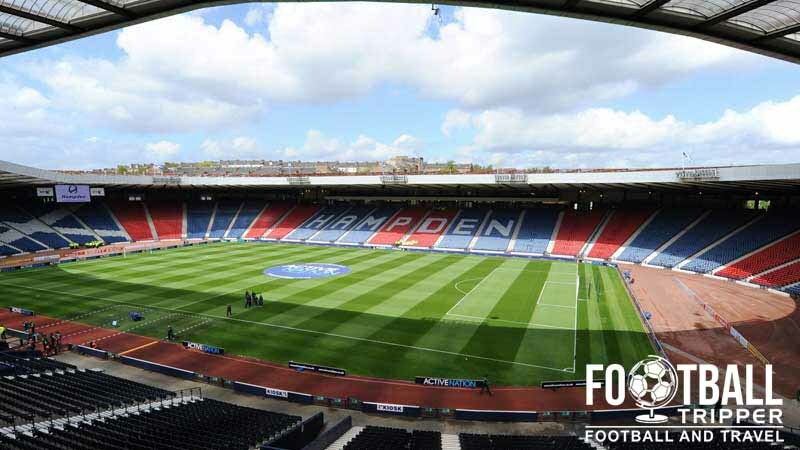 The closest hotels to Hampden Stadium are located 10-15 minutes away either side of Queen’s Park. Northwards there is the appropriately named Queens Park Hotel and to the south there is The Ivory Hotel. There are of course much more options in the centre of Glasgow such as Premier Inn and Travelodge.